My dad loved to cook! As as young girl, I remember he got a Campbell's Soup Cookbook one year for Christmas and proceeded to make many recipes from that little book. He also loved making each recipe his own by adding different spices, wine, etc. to the mix! Maybe that's where I also learned to change up the recipe? These 60-Minute Rolls came into our house when he was in his older years ... like late 60's (he'd be 92 now if he was still with us). He originally found them in a Maine Cookbook ... super-easy, very tasty yeast rolls that take 1 hour from start to finish. 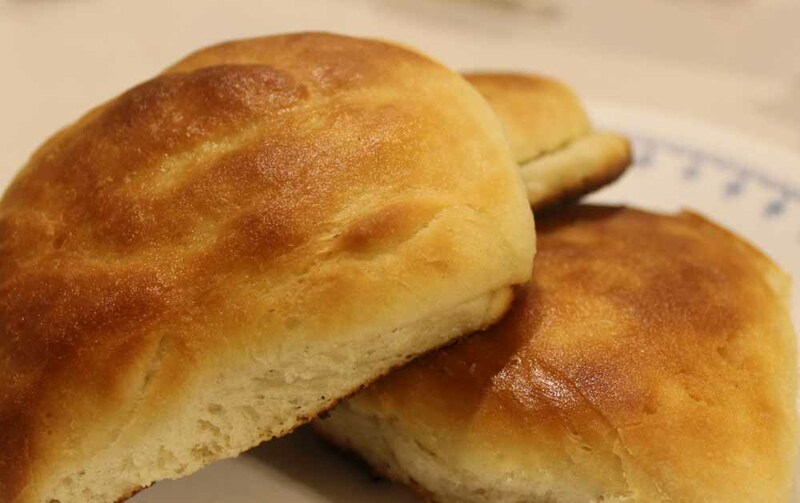 When the dough is patted out with your hands, and cut with a 2" round cutter, they are then brushed with melted butter and folded over in 1/2 to make half-moon shaped rolls. They are delicious served with butter, or try honey-butter for a different taste. Either way, they are yummy. My family loves them and I know yours will too! In a small bowl, dissolve yeast in ¼ cup warm water. In a large saucepan, put milk, sugar, salt and ½ of the butter; heat to lukewarm (I have also done this in the microwave, then just cool to lukewarm before proceeding). Add yeast mixture to milk/sugar/salt/butter mixture and stir to combine with a wooden spoon. In a large mixer bowl (I use my Kitchen Aid), using the dough hook, put 3 1/2 cups of the flour and add combined liquid ingredients. Turn mixer on low and beat until dough forms a ball, adding just enough more flour (approx. 1 cup) to make a soft dough (dough may be slightly sticky). Put out on floured board and knead until smooth (5 or so turns of the dough should be plenty). Dough should be soft, but not sticky. Place dough in a greased (I spray with Pam) bowl, cover with saran wrap and let rise in warm place for 15 minutes. Turn out onto floured board and pat out to 1/2” thick. Cut with a 2” cutter. Brush rolls with remaining butter and fold over in 1/2. Let rise on a greased baking sheet in a warm place for 15 minutes. Bake at 450 for 10 minutes. Raising dough tip – turn oven on to 400 for 1 minute – turn off and place dough in oven to rise. Works great every time! You will also need to turn the oven on again to 400 for 1 minute for the 2nd rising. These look delicious! I wish I had this recipe a few days ago for Thanksgiving! I am off to make some turkey stew and will make these to go with it. Yum!! I'm so glad! Hope you enjoy them as much as we do!